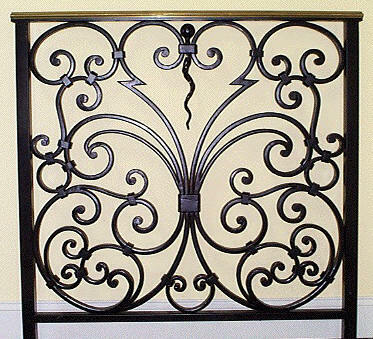 ﻿ Ornamental Metal Railings, Handrails, Fences, Gates and Balconies by Custom Design Metal Arts. Ocala Florida. Snub end scrolls and collars. Forged Aluminum....this just turned out to be a "sample" piece. It was done for a bank job, that didn't pan out. 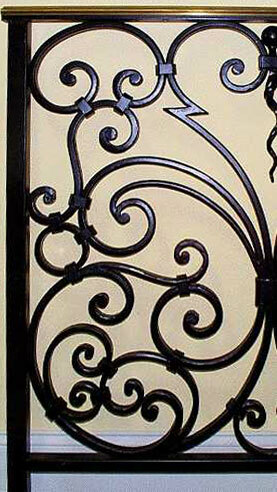 All of the solid aluminum scroll material have a forged, chamfered edge and terminate in forged snub ends. I forged this sample while at Klahm's, were it is to this day as an example of the possibilities. The design again..........was inspired from one of the classic "design" books, and altered to meet the 4" ball rule. Which is a building code, a safety stipulation that fabricators have to "deal" with. Which states....that a 4" ball can't pass through the railing.